Figure 2-73. 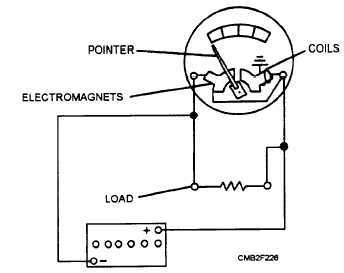 - Ammeter schematic. Figure 2-74. - Voltmeter schematic. system and is easier to interpret by the operator. During vehicle operation, the voltage indicated on the voltmeter is considered to be normal in a range of 13.2 to 14.5 volts for a 12-volt electrical system. As long as the system voltage remains in this range, the operator can assume that no problem exists. This contrasts with an ammeter, which gives the operator no indication of problems, such as an improperly calibrated voltage regulator, which could allow the battery to be drained by regulating system voltage to a level below normal. 1. LOW VOLTAGE WARNING LAMP (fig. 2-75) is set up to warn the operator whenever the electrical system voltage has dropped below the normal operational range. 2. NO-CHARGE INDICATOR (fig. 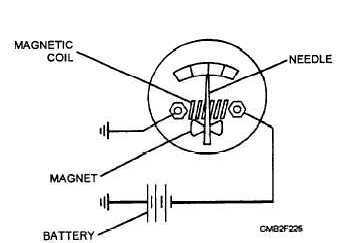 2-76) is set up to indicate whenever the alternator is not producing current. Figure 2-75. - Low voltage warning lamp schematic.